3 large bell peppers , tops sliced off and then seeded. Reserve the peppers whole and finely dice the tops that you cut off. Heat 1 tbsp oil and add the mustard seeds. When the crackle, add the udad dal and peanuts. Stir until lightly browned, about 1 minute. Add the onions and potatoes. Saute until the potatoes become quite tender, about 5 minutes. Add the turmeric, chilli powder and salt to taste. Add the chopped portion of the bell peppers and stir in. Cook, stirring, another 3-4 minutes. Add the cooked rice and mix well. Turn off heat and stir in the chopped coriander. Now stuff each of the three bell peppers with the brown rice all the way to the top. Top each pepper with the breadcrumb-miso mixture. Oil an oven-safe bowl in which you can accommodate all three peppers standing up. 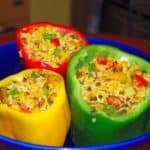 Place the bell peppers in it. Bake in a 350-degree oven for 30 minutes or until the breadcrumb topping is golden brown.